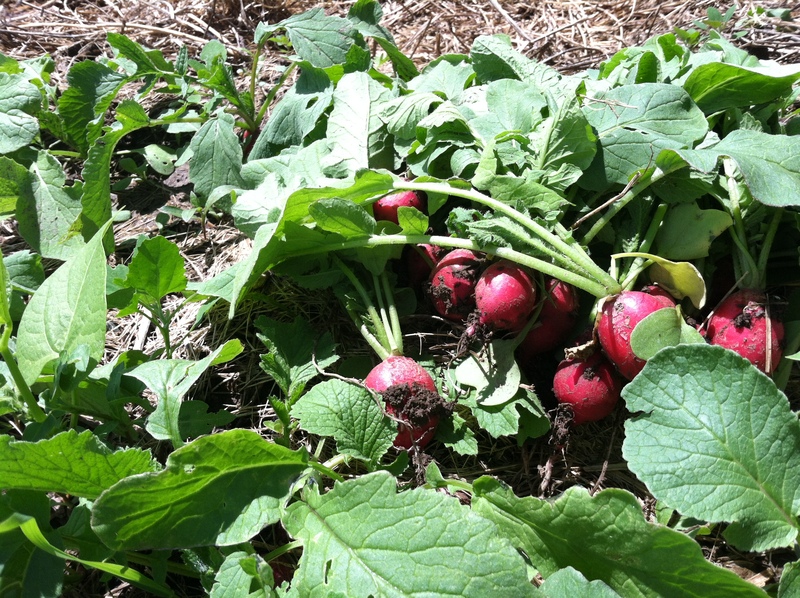 Let the truth be told…radishes have often found their way into my compost bin! Of course, that was a long, long, long time ago when I didn’t know better! Now that I understand how much work goes into vegetable gardening, I wouldn’t dream of gifting them to the kitchen gods quite so often. Even so, I can only eat so much radish. I like them. I like them a lot, but one or two a year seems to be quite enough for me! Well, after they exploded from the garden the other day, I realized I would soon have quite a number of radishes having dutifully companion planted them with my beans and carrots. Not only would the challenge be to create a highly palatable radish dish, but hopefully use the greens as well. The last few years I have been making quite a lot of fermented veg, so of course, using the radishes in that manner was the first thing that came to mind, but I am the only one in the house who will eat them. Thinking about the fermenting process reminded me of making kimchi – specifically of grating the veg and soaking it in salt water. This is a great trick for removing the “bglahh” from some of our more bitter friends! I also pondered a dressing that would highlight the earthy nature of the green knowing that those, too, must be included in the salad. It also occurred to me that a long time ago I used to make dressings with dijon mustard, but have forgone that option for my simple oil, vinegar and honey concoctions as of late. And so, this salad was born! I grated the radish with a bit of carrot, salted the mix for about an hour. Then I rinsed it and squeezed out the excess water. This was added to the finely chopped radish greens, tossed in the dijon curry vinaigrette and topped with toasted almonds. It is quite delicious if I might say so myself! The next week… I made the version below with white icicle radishes, massaged collard greens, a few leftover red peppers, the same curry dressing and a sprinkling of mustard flowers. Grate radishes and carrots. Sprinkle the grated veggies with kosher salt, mix together and let sit for an hour. Finely chop the radish leaves, cover and refrigerate. Mix all ingredients for vinaigrette. Taste and adjust as needed – some like more salt, more vinegar, more oil, more sweet. Once the salt has pulled much of the water from the veggies, rinse under cold water in a colander then squeeze extra water out. 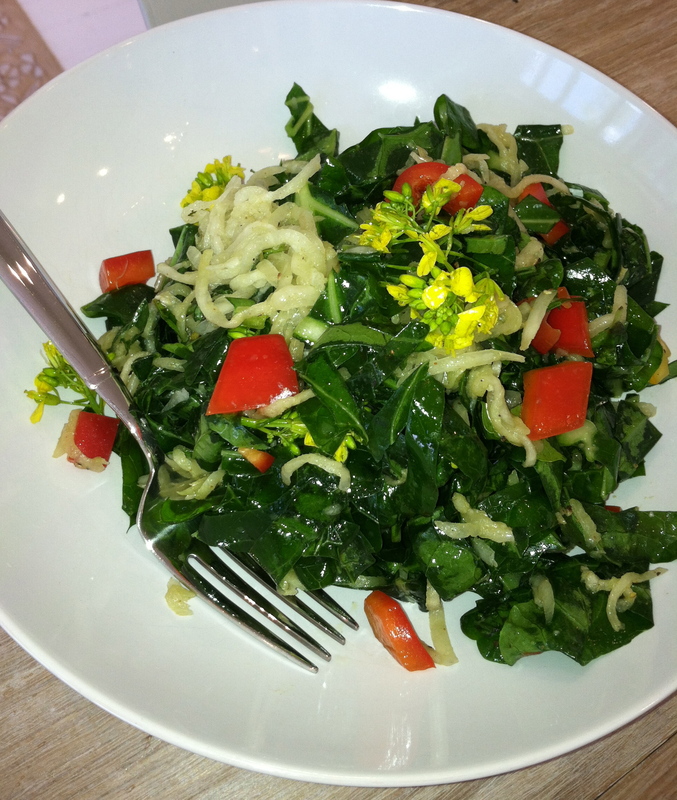 Toss greens, grated veggies and vinaigrette. Top with almonds right before serving. This salad can marinate in the fridge for a few hours before serving. Did you know that today is not only Cinco de Mayo, but it is also Cartoonist Day, Childhood Stroke Awareness Day, Oyster Day and Chocolate Custard Day? Tomorrow is National Crepe Suzette Day, Nurse’s Day, No Diet Day and No Homework Day! If you were wondering why everyone went around with Princess Leia earmuff buns yesterday, it’s because it was Intergalactic Star Wars Day! This is really important stuff to know. With the lists at http://www.checkiday.com/ I will finally have a purpose, a focus and a guiding light for each day of my life! Salad month for me is actually SALAD YEAR. I eat salad everyday. Sometimes my salad is interesting, but often it’s just a handful or two or the various greens from the fridge topped with nuts, fruit and other veggies. One thing is it is always delicious. We have nothing green yet in Minnesota, but thank goodness for spring in nearby places – eh hum – California and Mexico. If I were posting locally grown fare today, I’d have to serve last year’s applesauce, canned tomatoes or frozen pesto. 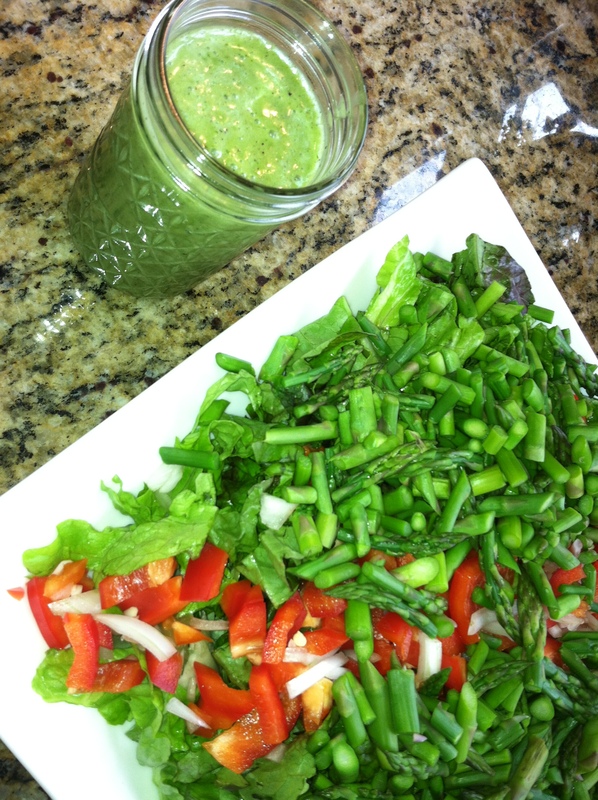 Longing for green and fresh, I opted for the spring flavors of asparagus and mint. This is a light and fresh salad with a surprise layer of flavors. Perhaps I’ll use the Salad Month idea to inspire more interesting salads! Directions: Chop and steam the asparagus for 2 minutes. It should be bright green and crisp. Chop the lettuce, mint, red peppers and onion. Mix the mint with the lettuce in a serving bowl. Top with the peppers, asparagus and onion. Mix all ingredients for dressing in a blender until well mixed. I always taste to see if it needs more salt, oil or vinegar. 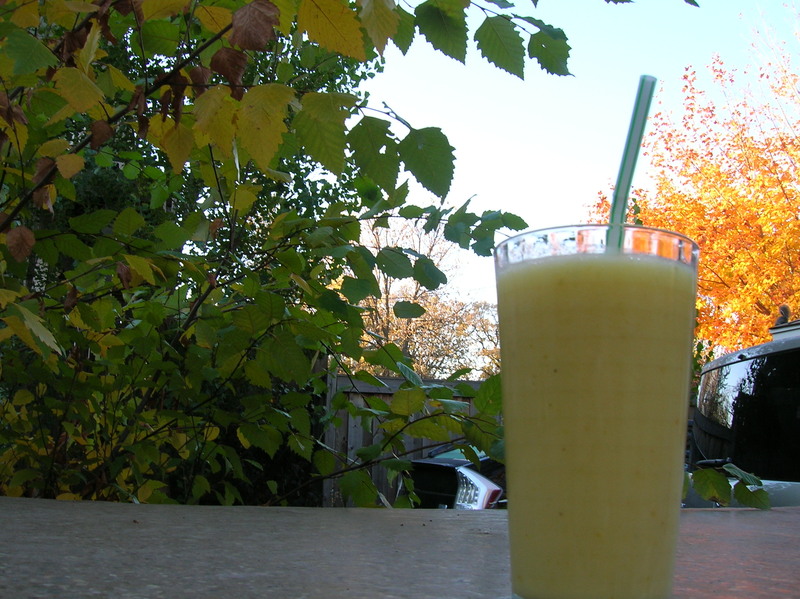 Nothing like a little taste of the tropics on a frosty fall morning in Minnesota! A friend of mine started juicing and making smoothies a few weeks ago and made an interesting comment. She said, “It’s like this stuff just wants to burn fat!” So true and so amazing. All the enzyme action of the fresh fruit and veg will have the pounds melting off before you know it. What are you waiting for? Let’s take on this obesity epidemic with some really simple and delicious foods. Don’t forget “smoothie” means you make it in the blender. Enjoy! These bad boys fall into the dessert category for me, so I wouldn’t normally encourage anyone to have such treats around the house, but my dad’s honey is just the most amazing thing, and I wanted to come up with a way to really highlight its sweetness. In an effort the last few months to stay away from grains, raw almonds have found their way into our pantry along with a few other nuts and seeds like cashews, pumpkin and sunflower. Apparently when eaten in small quantities, these powerhouses of life provide healthy fats, omega-3 as well as a myriad of other vitamins and minerals. That is when they are raw. Turning them into dessert by toasting them probably diminishes much of the health benefits. 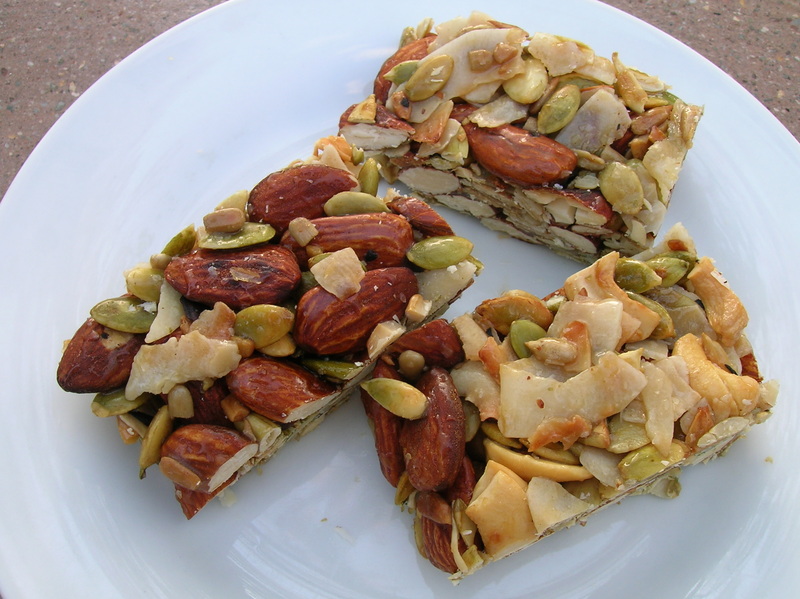 Regardless, these brittle bars are a really tasty snack made from all whole foods. If anything, they are a good source of energy for your average marathoner or long-distance biker. Since Jeff completed 72 miles this morning, I think I’ll encourage him to have a few of these! Once these cool, they do become brittle, however as they rise to room temperature the honey begins to soften. I would recommend cutting them and storing them in the freezer in an airtight container. In a non-reactive sauce pan slowly melt the coconut oil. Add the honey and bring it to a simmer. Stir frequently and allow the mixture to simmer for about ten minutes. While the honey simmers, toast the nuts separately as the small ones will burn if you try to toast them together. After each batch is toasted pour them out onto plates to cool in a single layer. Once the nuts are all toasted and the honey has simmered and evaporated for ten minutes, pour the honey mixture over the nuts and mix well. Pour the mixture out into a 9×9 square baking pan lined with parchment paper. The bars will be about an inch thick in this pan. Use another sheet of parchment on top to press the mixture firmly together. Place in the refrigerator to cool. Cut into squares and store in airtight container in freezer. Oh, the flavors! Oh, the warmth! Oh, the kale! I can’t get enough of the stuff! I’ve consumed four large bunches and another of swiss chard this week – almost entirely on my own! Once I started eating it, I couldn’t get enough! The same happened with beets, and I think sweet potatoes must be right up there in the Gotta Have It department. While the rest of you “Master” cleanse, juice and go raw, I’m focusing on ROY G. BIV and powerful spices warmed to perfection! 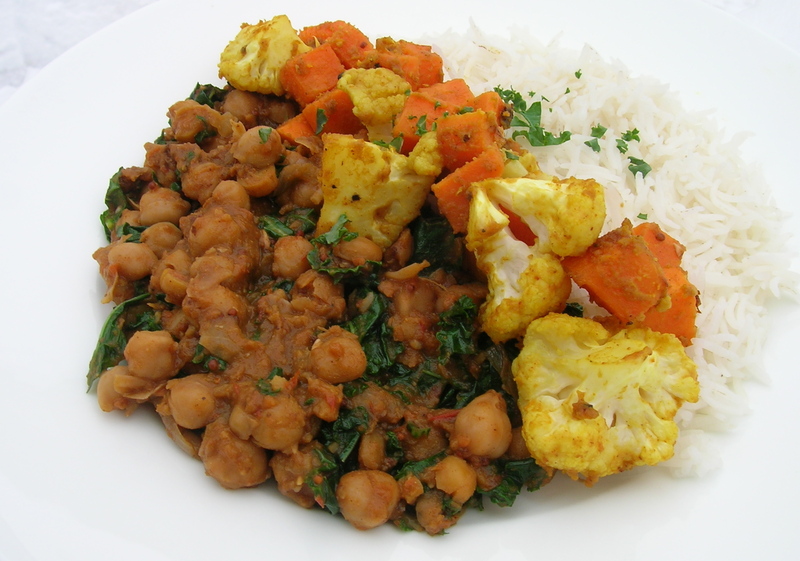 Directions: Cook chickpeas or use canned. On medium heat, melt coconut oil. Add red onion and saute until translucent. Add cumin, brown mustard seed and Garam Masala to the oil for a quick toast. Next add garlic, ginger and chile pepper. All these ingredients should be cooked for a minute or so, just until the aromas are released. Next, add the pureed tomato, coconut milk and chickpeas. Allow to simmer on very low heat for about 5 minutes. Right before serving, mix in the kale cooking it just past raw to bright green. Directions: Warm the coconut milk and the peanut butter in a small pot. When the peanut butter begins to melt, whisk the two ingredients together. Add spices and mix well. Toss in cauliflower and sweet potatoes. Allow to steam on low heat for a few minutes until vegetables are tender. Note: I tried roasting the veggies with the sauce at 450 degrees. They cooked, but did not crisp at all. I love the idea of serving the cauliflower roasted like I did here. Next time. Enough of the death dirge already! I hear you. A few of my “fans” have been concerned that the black shroud and “Mock Chicken” was a sign of death to the blog. Perhaps I was one of those bloggers not quite willing to come right out and wrap it up, you thought. Truth be told, I never intended to be away so long, but in all my moments of cooking, have had little to motivate. Summer’s end brought me back to work with no weekly CSA and little motivation. The family plate reverted to our standby Mexican stuffed burritos with a variety of salsa, simple soups or stir-fries. Not much that was blog-worthy, I’m afraid. 1) Wash and devein kale. Chop and saute in a splash of olive oil. Cook until just wilted and still bright green. 2) Grate sweet potatoes and beets. Place in large stock pot with olive oil and water to cover. Add salt and pepper, vinegar, honey, garam masala. Bring to slow simmer and cook until beets are just tender. 3) Toast slivered almonds in a dry skillet. Keep the almonds moving, and toast until the edges start to brown. Turn the toasted almonds out onto a cool plate. 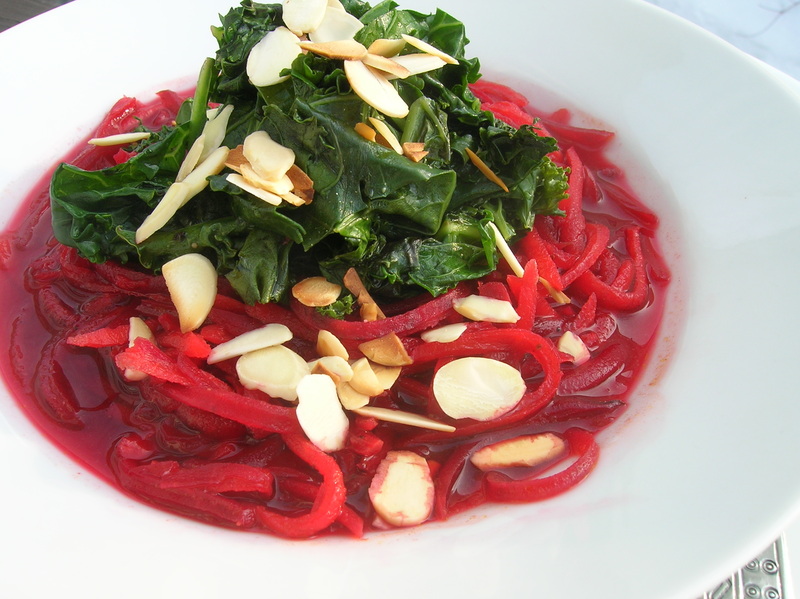 3) Serve in large bowls with greens and toasted almonds on top. I’ve often wondered how mock duck was made. I knew what it was – wheat gluten – but never knew what the process involved. I finally decided to do a little research only to realize that mock duck is basically a dumpling. It’s also very easy to make. I found a recipe on a site called, Ma Cooks! and used this as the springboard for this recipe.You’ll notice by the garlic, cumin and oregano, that this mock duck is destined for a Latin American theme. In fact, I hope to use it to make green chile enchiladas. Jeff returned yesterday from a conference in Albuquerque and upon my most pointed request, carried with him five giant tubs of frozen chiles. If you have never used frozen New Mexican chiles before, I highly recommend urging any friend traveling to the Southwest to traffic for you as much as they can carry. The Bueno Foods website will deliver six small containers for $25 dollars plus a $50 dollar delivery fee! I’m sure there are many New Mexican transplants who are willing to pay this exorbitant fee. Mix the gluten, rice flour, salt and water together. Knead briefly until the gluten strands develop. Let the dough rest while you prepare the stock. Use a stock pot to saute onions in the canola oil until translucent, add garlic and spices. Cook for a minute until the spices and garlic are lightly cooked and giving off aroma. Add four cups of water to the stock pot and bring to a boil. Lightly knead the mock duck dough and break into six to eight pieces. Once the stock comes to a boil, lower the heat to a simmer, place the mock duck dough into the water, cover and slowly simmer for about an hour. 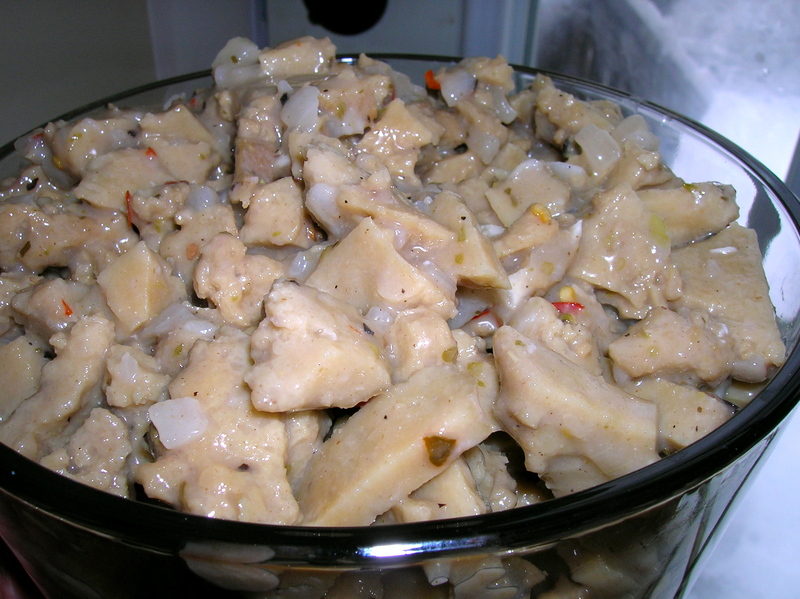 Once it is finished, it can be sliced and added to any dish calling for chicken. I would caution you not to use it in really wet dishes as the texture gets a little mushy. I’ve found with a pizza oven in the back yard, dairy product consumption is at an all-time high around our house, and has given me a little pause. And although we’re still topping our little wood-fired babies with fresh mozzarella, Pecorino Romano, and Gorgonzola, I’ve begun to wonder about vegan alternatives to cheese. I’m not yet ready to take the dive, but thought I would start experimenting with vegan cream sauces. This recipe has as it’s base walnuts, olive oil and tahini and when mixed with a little soymilk, turned white and creamy and sweet. 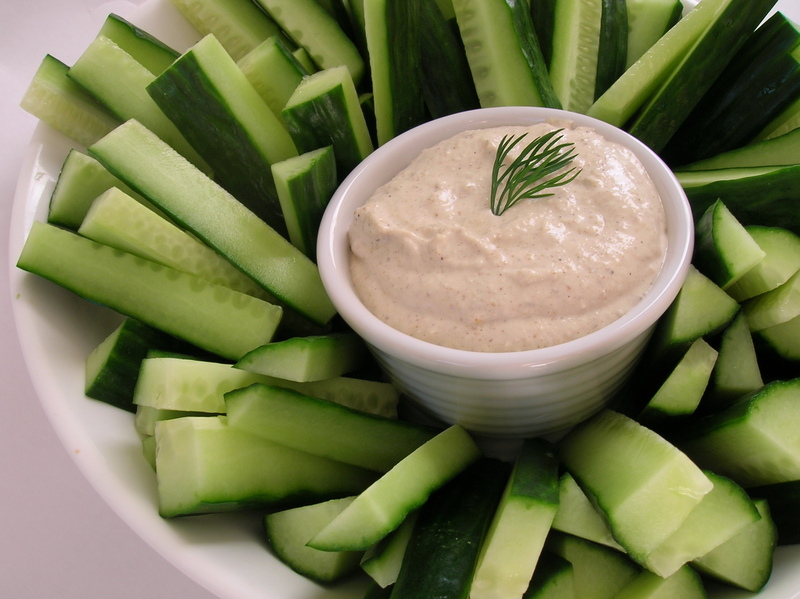 I was surprised by how sweet my plain soymilk made the dip, so to make it savory for the cucumber sticks, I added garlic, white wine vinegar and Garam Masala. As you can see I served it with vegetables, but it’s very satisfying spread on crackers as well. I might try it another time, sans savories, as the cream filling for a chilled fruit tart. 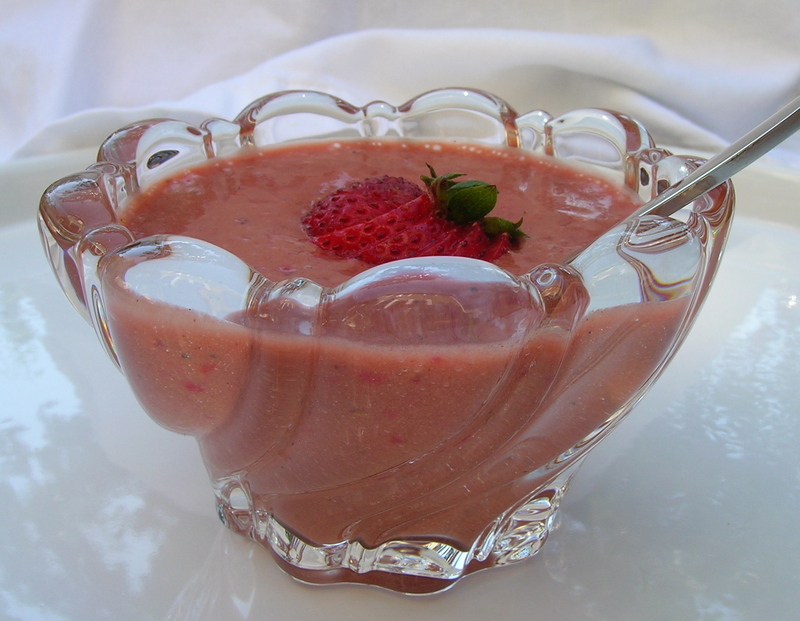 Directions: Mix all ingredients together in a food processor until smooth and creamy. Add more or less soymilk depending on how thick you want the dip. Are you tired of fresh corn on the cob? Turn it into a fresh, spicy burrito garnish! If you eat at Chipotle as much as our family, then you will love this recipe when staying in for burritos. When a kid loves something from a restaurant they usually won’t have anything to do with a “re-creation” from home, but in this case, the fresh corn, and the fun of watching me cut it off the cob, enticed Max into full love! This recipe is unbelievably simple, uses fresh corn, and just a little can really add pizzazz to a burrito stuffed with black beans, brown rice, tomatillo salsa and crema. 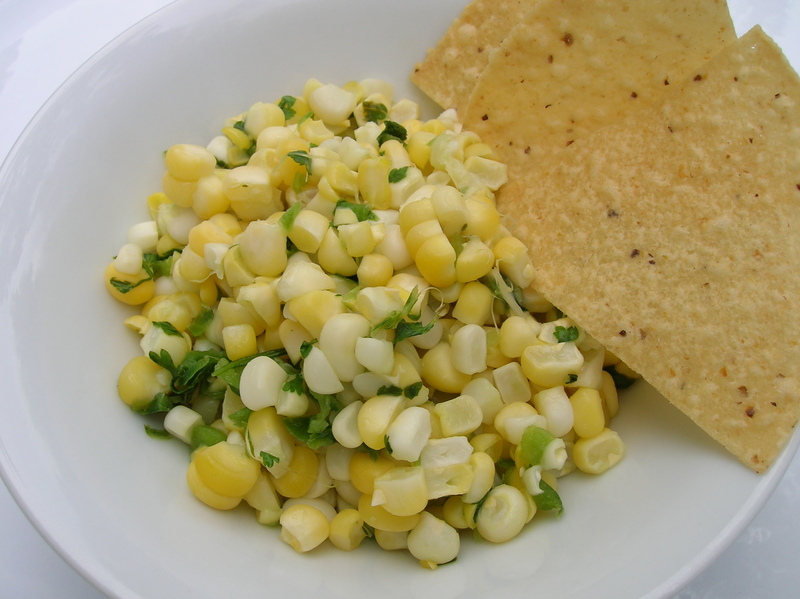 The trick to this recipe is to zap the corn, husk and all, in the microwave for five minutes. While the corn is cooking, chop the jalapeno and cilantro. It will all be finished in six minutes, tops! Microwave corn with the husk. Meanwhile, chop the jalapenos and cilantro and juice the lime over them. When the corn is finished, remove the husks and cut the kernels from the cob. Mix together in a bowl and add a little salt to taste. Cool in the refrigerator. I’ve been staring at zucchini in the crisper drawer for days – and of course, it multiplied. I don’t know how it does that. One minute you have three little demure zucchini hanging out in the fridge, then suddenly there are eight, they are huge and they are staring back at you! There must be an algorithm for this monster…if three go in and eight come out the formula may be 2x + 2, but how does one explain their increase in size? Not only are the zucchini in the fridge multiplying, but mother nature has determined that running the oven in our house is not an option. With temps in the 90s and dew points in the 70s, there will be no zucchini crusted pizza, gratin, or cake. I just can’t risk the respite of an air-conditioned space when facing these extremes. So the zucchini remained chilled, and it’s growth pattern stopped in a quick zing through the shredder. I tossed this salad in lemon, olive oil and agave like in the Sweet and Sour Slaw with Wilted Kale from a couple of weeks ago, and it turned out very light, refreshing and delicious. Note: The zucchini will drain quite a lot of water once you put the salt on it, so it should be served shortly after combining the vegetables with the dressing. Grate and slice the vegetables. 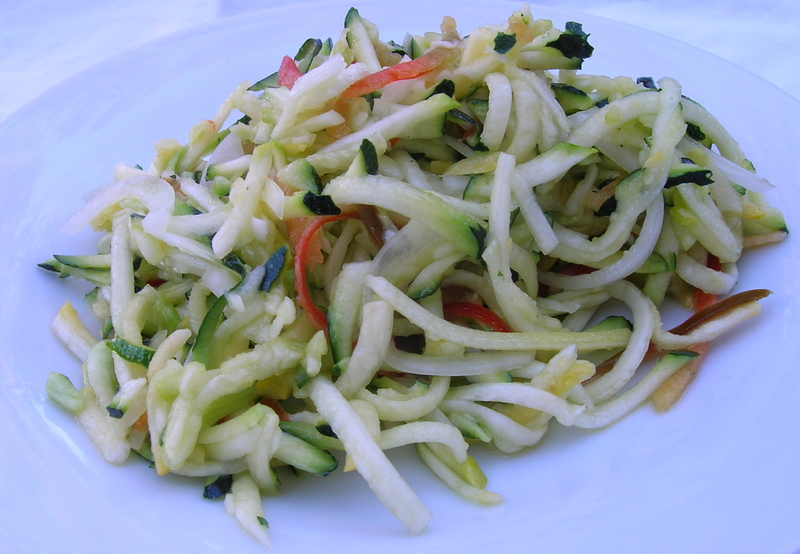 Squeeze the lemon over the zucchini, add the olive oil, agave and salt and mix well. All cooks have a signature style. More often than not, mine is heavily dependent on the food processor, and involves creating slathers, spreads and dips. All cooks who are bloggers have a signature style, too. Our photos begin to look the same, the reader recognizes dishware, a preferred backdrop and lighting tendencies, but more importantly, the food begins to look like other previously created dishes. We all fall back on cooking practices that lie within our repertoire. This fresh snap pea chutney, however, will fool you. I know it looks like other spreads and slathers I have created, but this one is surprising. You’ll be even more astonished when you find how it was served this evening. Before I get to that, let me give you a little background. On the Fourth of July, my most favorite auntie brought for appetizers, a huge bowl of garden fresh snap peas – move over edamame! 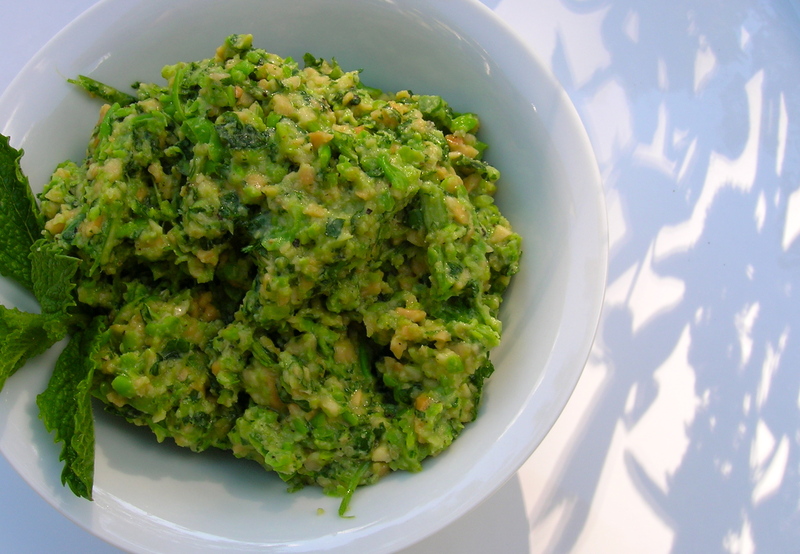 We sat around the kitchen table shelling the crisp little bundles and munching on fresh peas. Well, that got me to thinking about the snap peas that came in my CSA box. Last week we ate our snap peas with the pod on a chop salad, but this week I decided to shell them and turn them into a sort of chutney. I also got a new cast iron wok to play with, so wanted to mix up a little Asian dinner. 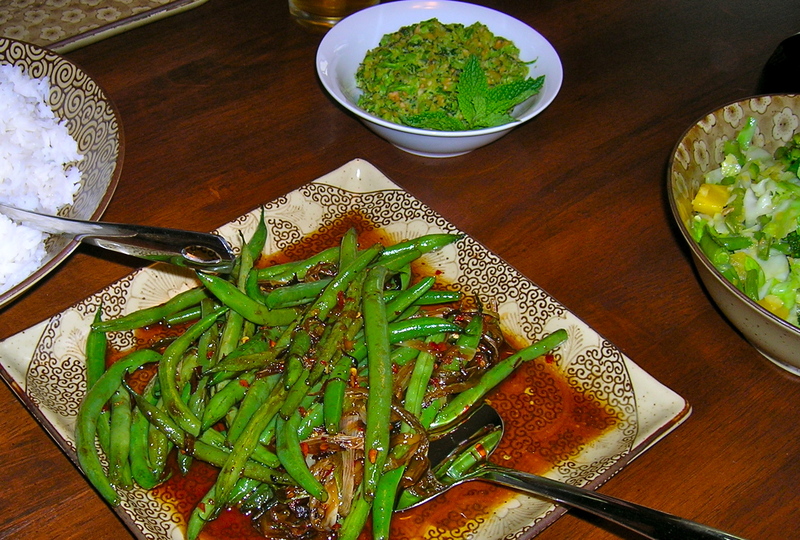 How could snap pea chutney and a stir-fry be paired? With peanuts and mint, what else! Bring on that fresh Southeast Asia blend to lighten a hot and spicy crispy fried green bean and ginger-fried cabbage. Do they do this in China? Do they serve a light condiment like they do in India to help relieve the heat, layer flavors and surprise the palate? Well, today it happened in my kitchen and it was fantastic. 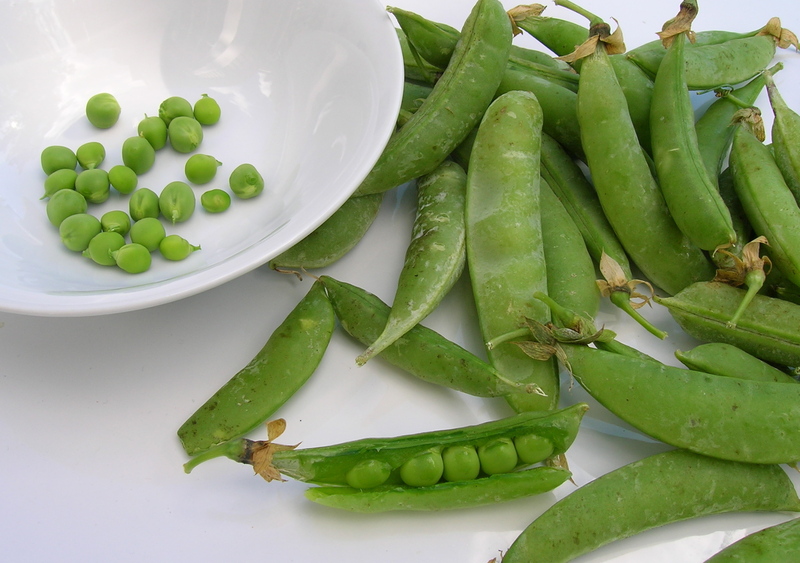 Steam the peas over boiling water for three minutes until bright green and tender. Place all ingredients into food processor and pulse until blended. I opted to leave this one a little chunky, and the texture was a nice contribution to the meal. One of the sweetest treats delivered by our CSA this summer – diminutive, fresh and utterly perfect – strawberries! 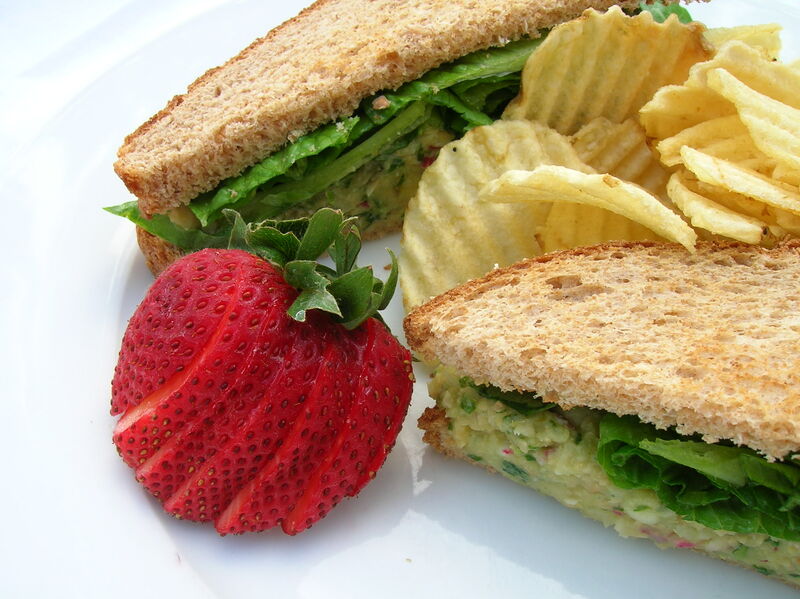 With a box full of veggies screaming “Chop Salad!” the strawberries seemed the perfect match to the fresh crispness of the greens.This could be the “red” part of your Fourth of July weekend! The idea here is to eat this spread like you would egg salad – sans eggs. This is a full-on vegan version. A jar of State Fair Bread and Butter pickles is really what motivated me in combination with wanting to get creative with the last few vestiges of the first week’s CSA: a small bunch of arugula, some radishes and green onions. 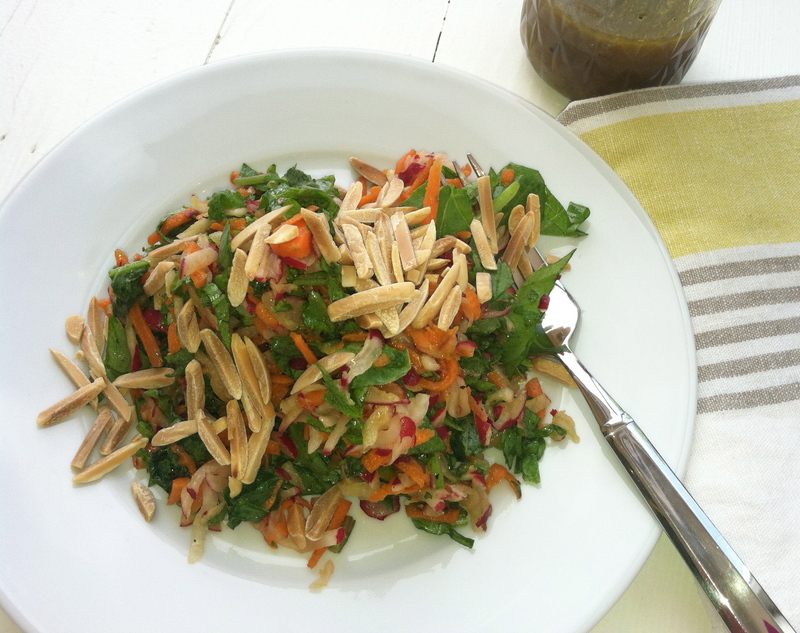 The cool salad makes an easy and refreshing summer meal. Chop the radishes and sprinkle with salt in mixing bowl. Next add chopped pickles, green onions, arugula, lime juice, garbanzo beans and 1 Tbs. olive oil. Mix well. Heat another Tbs. of olive oil in a sauce pan. Add the mustard seeds and toast until they begin to pop. Pour the oil and seeds into the slather and mix together. Refrigerate and serve cold on toasted bread. It’s been awhile since I’ve heard screeches and yelps coming from my crisper drawer, but this morning a perky bunch of leaf lettuce sang delightedly and asked to be rolled up with fresh veggies like a little petite bouquet. Or perhaps a nosegay in honor of prom? After cutting the bottom off the leaf lettuce and washing it in the colander, I saw that each lovely piece could be rolled and somehow tied. Fortunately Kate was here to save the day. I was about to send Jeff to the co-op for leeks which I knew would work well to tie the bundle, when Kate suggested I use flat peels of carrot. The carrot added a splash of color, and when speared diagonally with a toothpick, held the salad bouquets together nicely. Another reason I chose to venture into the realm of salad rolls is that the Lemon Walnut Dressing I made for the salad came out very thick and spreadable. I knew it would hold up well as a salad slather for this project as it had little liquid to cause the greens to break down and would allow me to make the rolls ahead of time. One head of leaf lettuce will probably have enough leaves for ten to twelve rolls. Wash the leaf lettuce and allow it to thoroughly dry in a colander. Prep the veggies and make the dressing. To assemble the rolls spread the dressing on the leaf and fill with two or three slices of each veggie. 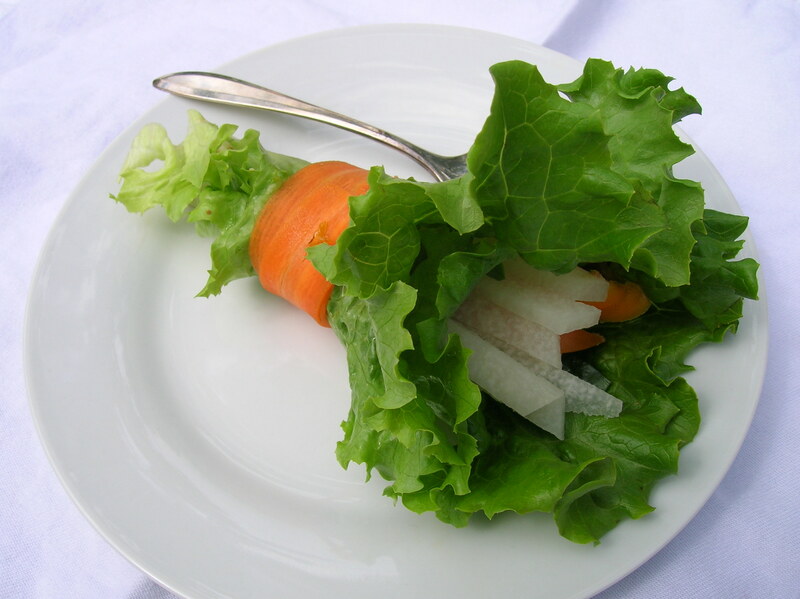 Roll up the lettuce and wrap the carrot peel tightly around the middle. Spear the end of the carrot peel at a diagonal from the top of the bouquet to the bottom so it does not poke through the opposite side.